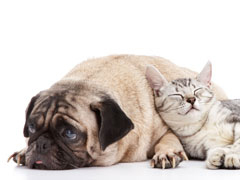 Millstone Animal Hospital is a well-established, small animal veterinary hospital providing comprehensive medical and routine surgical care for dogs and cats in south-central New Jersey. We provide a broad spectrum of diagnostic procedures through the use of external laboratories, and also work closely with larger referral practices when special diagnostic procedures are required. At the Millstone Animal Hospital we strive to offer our clients sound, honest advice and optimal veterinary care, thus allowing you the enjoyment of your companion for a maximum number of years. Our job is not only to treat your pet when he or she isn't feeling well, but also to help you learn how to keep your best friend happy and healthy. The Small Animal Medicine part of our practice is limited to dogs and cats and is designed to provide a comfortable, clean, friendly, small-town environment where you and your pet will feel at home. We strive to provide economical and personal veterinary care to the special people and there pets that become part of our practice family. You will always see the same Doctor at our practice, and when advanced or state of the art surgical and/or medical procedures are indicated or requested, Dr. Koster will personally refer our clients to the referral practices and local board certified specialists that we feel are best suited for each individual situation. Dr. Koster treats her clients' pets the same way she treats her own -- with all the advances in veterinary medicine in recent years, our pets deserve the best that veterinary medicine has to offer and nothing less. We have a special interest in ear cropping (cosmetic ear surgery) for many breeds of dogs including: American Staffordshire Terriers, Pit Bulls, Boxers, Doberman Pinschers, Great Danes, German Pinschers, Schnauzers, Miniature Pinschers, as well as other AKC recognized breeds and various rare breeds. We are one of the few veterinary practices on the East Coast that provides this special service.